Are you a visitor to Korea and would like your hotel to stock copies of SEOUL, our monthly travel and culture magazine? 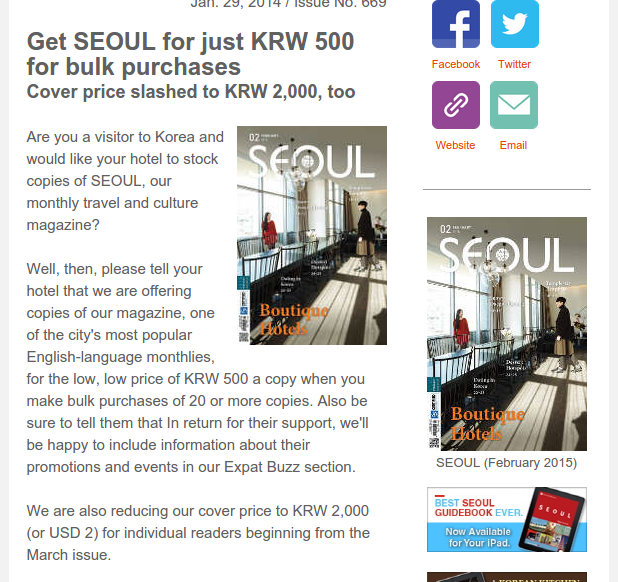 Well, then, please tell your hotel that we are offering copies of our magazine, one of the city’s most popular English-language monthlies, for the low, low price of KRW 500 a copy when you make bulk purchases of 20 or more copies. Also be sure to tell them that In return for their support, we’ll be happy to include information about their promotions and events in our Expat Buzz section. We are also reducing our cover price to KRW 2,000 (or USD 2) for individual readers beginning from the March issue. Since we’re talking about SEOUL, the February issue of SEOUL is out and in stores. In this issue, we visit some boutique hotels, travel to the snowy highlands of the Daegwallyeong Pass, talk about multicultural dating in Korea, experience the Templestay program of Beopjusa Temple and much, much more. And don’t forget, you can read it on your mobile device by downloading our app (iOS, Android). Why are the Chinese obsessed with Korean culture? Expats are shaking up Korea’s makgeolli scene. North Korea joins the mobile revolution. NYT readers react to a recent story about Korean adoptees moving back to Korea. YISS is a Kindergarten (age 5) through 12th grade college-preparatory international school where a commitment to academic excellence is fostered through the encouragement of exploration, risk taking and inquisitiveness. Accredited by both WASC and ACSI, YISS offers a well-rounded educational program based on the U.S. model, fostering a student body of over 1,000 pupils representing more than 50 different countries. GETTING THERE: See this map. Beopjusa, or â€œTemple Where the Dharma Dwells,â€ was founded in 553 during the reign of King Jinheung (r. 540-576) of the Silla Kingdom (57 B.C.-A.D. 935). It would develop into the largest and most important Buddhist temple in the central Hoseo region, or what is known today as the Chungcheong-do provinces. During the Goryeo Dynasty (918-1392) — the templeâ€™s heyday — Beopjusaâ€™s 70 halls housed as many as 3,000 monks, overseeing about 70 hermitages in the surrounding mountains. Even today, the temple remains an important and active center of Korean Buddhism. It is home to no less than 43 cultural properties, including the temple itself as well as the breathtaking Palsangjeon Hall, one of Korea’s few remaining wooden pagodas. Standing five stories high, the ornate structure cuts an impressive figure against the verdant hillsides and deep blue sky. Italian painter Giorgio Morandi (1890-1964) specialized in still life and landscape scenes, producing works that have gained renown for their subtlety and simplicity. Rather than being swayed by popular philosophies and techniques at the time, Morandi quietly and methodically practiced his own investigation into the metaphysical nature of the objects he encountered every day — items such as bottles, vases and books. So dedicated was Morandi to the visual shape and forms of his subjects, he is known to have taken extensive measures to remove anything that would distract from the composition, including the labels or other unnecessary decoration. The exhibition features 40 pieces of Morandiâ€™s work, and will also display works of Morandiâ€™s Korean contemporaries. The landmark Dongdaemun Design Plaza is hosting a retrospective to mark the 10th anniversary of legendary French photographer Henri Cartier-Bresson’s death. 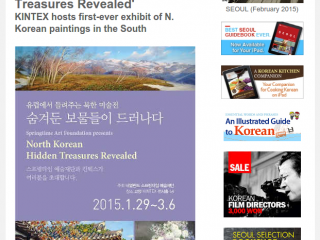 The exhibition features 259 original prints never before seen in Korea. Cartier-Bresson is considered the father of photojournalism and street photography and is one of the founders of Magnum Photos. Four-time Grammy award-winning singer Michael Buble is coming to Seoul for the first time! This tour is the Canadian’s fifth worldwide, and his very first Asia tour. Buble’s â€œTo Be Loved Tourâ€ album, with its hit single “It’s a Beautiful Day,” is an entertaining mix of jazz, swing and pop with a retro Rat Pack, big-band feel. The Springtime Art Foundation of the Netherlands presents “North Korean Hidden Treasures Revealed,” an exhibition of about 150 paintings by 70 North Korean artists, some of whom are international award winners. The exhibition, which has already toured Europe, is the first exhibition featuring artwork by North Korean artists held in South Korea. Prior to the division of Korea, Cheorwon was a sizable town. The junction of the Seoul-Wonsan and the Mt. Geumgangsan lines, it was a major transportation hub. After the division of Korea, however, the city — located north of the 38th parallel — fell under North Korean control. The worst came during the Korean War: as the southern point of the Iron Triangle (a major invasion route to Seoul), the city was wiped off the map by merciless shelling, mostly courtesy the Americans. After the war, the city was never rebuilt, per se, although a â€œNewâ€ Cheorwon was built several kilometers away. Old Cheorwon is now rice paddies and hills — much of where the old town used to be, in fact, lies across the Civilian Control Line, a military district bounding the DMZ where entry is by permit only. For Korean history buffs, however, the paddies are dotted with several ruins and bombed-out buildings from the period that are well-worth seeing, including the iconic ruins of the local headquarters of the Workers Party of Korea, North Koreaâ€™s ruling party. Also in Cheorwon is the Seungil-gyo, sometimes called â€œKoreaâ€™s Bridge Over the River Kwai,â€ a scenic arch bridge that, depending on who you believe, was either started by the North Koreans and finished by the South Koreans, or started by the Japanese and finished by the Americans. 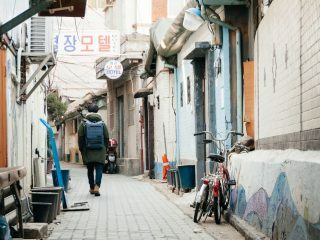 Neighborhood shop in Seoulâ€™s Ihwa Mural Village. Photographed by Robert Koehler.